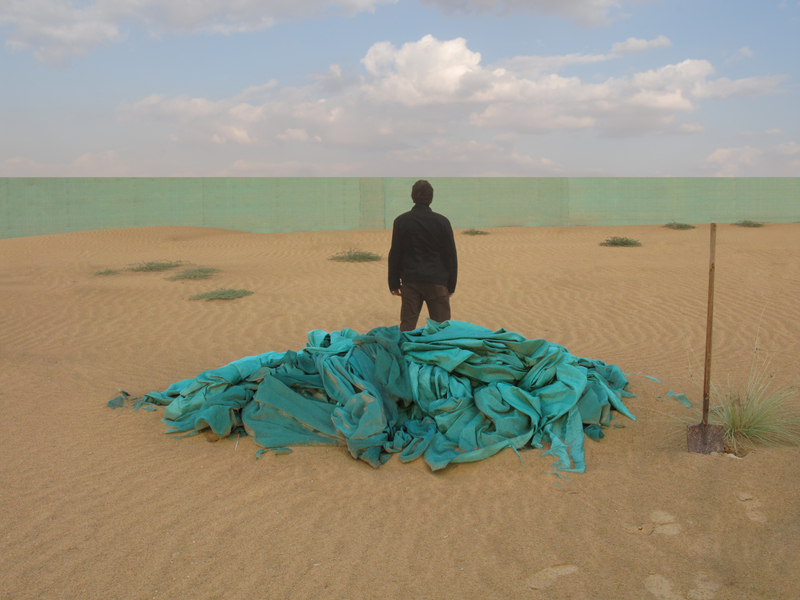 Tarek Al Ghoussein has spent the past 10 years considering how performance, interventions and photographic methods can be used to explore what it means to be situated within a landscape. The anonymous spaces of the desert have served as a stage for investigating how political circumstances affect one's relationship to a place through the propagation of myths and the creation of physical boundaries. While the images can be understood within the broader context of Palestinian struggles, Tarek Al Ghoussein simply and persistently tries to negotiate his existence and place in this part of the world. Contrasts between the landscape and the figure provide an opportunity to consider our relationship to the places that may not belong to us but that we nevertheless call home. A mid-career retrospective of Al Ghoussein’s work was organised by the Sharjah Art Foundation and the exhibited at the Sharjah Art Museum in November 2009. 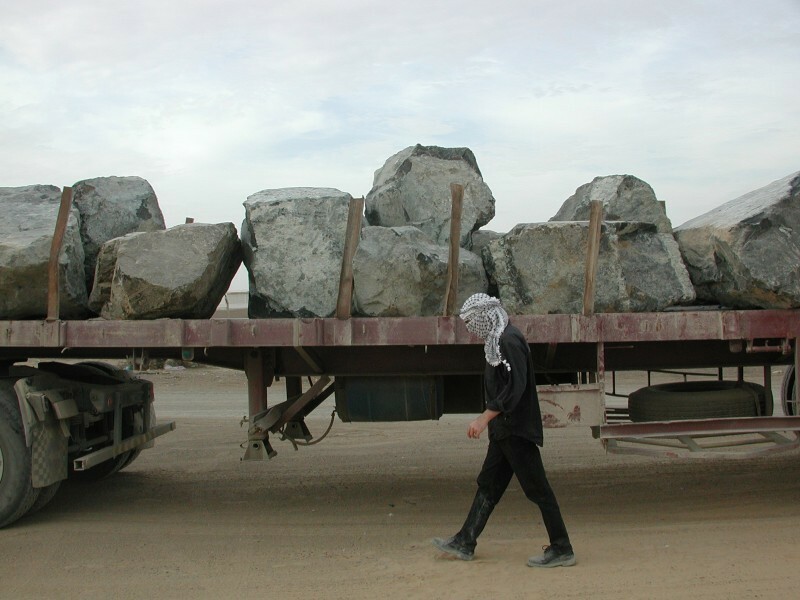 His work was also included in the Sharjah Biennials in 2005 and 2003, as well as in Disorientation II, 2009. Born in Kuwait in 1972, Al Ghoussein lived for several years in Japan and has been based in the United Arab Emirates since 1998. He obtained a BFA from NYU and a MA in Photography from The University of New Mexico in 1987. His work has been shown internationally including solo presentations at Sharjah Art Museum (2009) and Al Ma'mal Foundation, Jerusalem (2009), and in group presentations including the Kunstmuseum Bochum, Germany (2010),Venice Biennale (2009), Disorientation II, Abu Dhabi (2009), Singapore Biennale (2008), Brussels Biennial (2008), Blue Coat, Liverpool (2008), Nimes Museum of Contemporary Art, Nimes (2008), Royal Photography Museum, Copenhagen (2006), Al Riwaq, Bahrain (2006), Heidlberg Museum, Heidelberg, Germany (2006), Sharjah Biennial (2005), Danish Academy of Fine Art, Denmark (2003), Sharjah Biennial (2003). Al-Ghoussein's work is in permanent collections at the Victoria and Albert Museum, London, the Royal Museum of Photography, Copenhagen, Darat Al Funun, Amman, the Sharjah Art Foundation, UAE, and the Solomon R. Guggenheim Museum, New York. Tarek Al Ghoussein is currently Associate Professor of Photography at the School of Architecture and Design at the American University of Sharjah. A monograph on the artist, In Absentia – Photographs by Tarek Al Ghoussein was published in 2008 by the Third Line Gallery, Dubai. This magnificent retrospective at the Sharjah Art Museum, clarifies the extent to which Tarek Al Ghoussein expresses his image testimonials through a play of contrasts.